There is a bridge in Paris called the Pont Des Arts Bridge, where for many years, lovers have been visiting this site, writing their initials or putting a photo on a padlock and attaching it to the bridge as a sign of their love. Yes, Paris definitely brings out the romantic in people. The problem is, now this bridge is collapsing in one area of its fencing due to the overwhelming amount of locks padlocked to the bridge. These ‘lovelocks,’ once a testament of the endurance of love, are now perhaps a suggestion that love is just too darn heavy. Or perhaps, too much love is overkill? 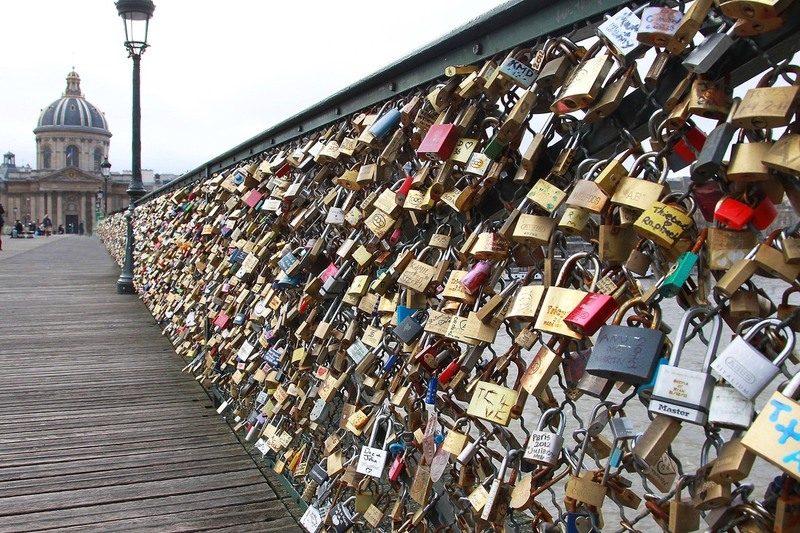 This symbolic act of chaining one’s love to bridges in a lovelock is not exclusive to Paris apparently. Bridges all over the world have experienced the same fate, from Russia, to Hungary, China to Guam (something tells me the penalties for this in some places is much more scary). Apparently the idea came from two Italian novels in the early nineties where the gesture was first introduced. So I suppose Paris can blame Italy at the moment for having to close the Pont Des Arts Bridge for a day. I am all for public safety, and certainly don’t want the bridge to give out one day under the weight of all that love, but I would also hate to see another tradition get pushed to the wayside. Not sure what the solution is (another bridge? A lovelock wall? A mountain of locks in the French countryside? ), but if anyone can figure it out, it's the city d'amour!